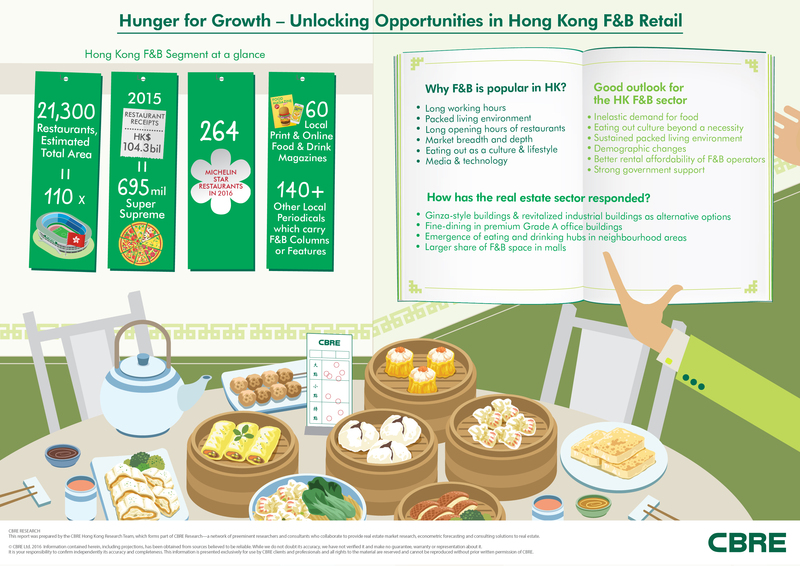 Hong Kong, September 7, 2016 – CBRE today published a Hong Kong major report, Hunger for Growth – Unlocking Opportunities in Food and Beverage Retail. The report highlights how Hong Kong’s food and beverage (F&B) sector has remained resilient despite the weak overall retail market. With numerous commercial and residential development projects planned for the next five years, CBRE predicts that the strong growth momentum of the F&B sector is unlikely to slow anytime soon. The number of licensed eateries in Hong Kong has increased by 37% from 2003 to 2015. According to the Census and Statistics Department, while total retail sales dropped by 3.7% y-o-y in 2015 and further declined by 10.5% y-o-y in the first half of 2016, total restaurant receipts grew steadily by 3.9% y-o-y and 2.5% y-o-y respectively over the same periods. In view of the changing retail landscape and the growth potential of F&B, commercial property landlords are becoming more willing to sign F&B operators and have allocated more space in their portfolio for F&B tenants. Shopping mall landlords are also acknowledging the effects of bars and restaurants in enhancing their positioning and increasing footfall to benefit other retailers. Another noteworthy trend is the incorporation of fine dining restaurants in premium office buildings, which helps landlords raise the profile of their properties. These floors usually command premium rents over conventional retail space due to their unobstructed views, open spaces, balconies and sky gardens. So far, nine out of 230 Grade A office buildings in Hong Kong have F&B floors, with more expected to come. ​In addition, more commercial building owners are converting their premises to Ginza-retail buildings to maximize rental returns. F&B floors in less prominent commercial buildings can typically achieve an additional 20% in rental premium compared to office floors. Demand for F&B options is likely to grow substantially over the next few years as a result of commercial and residential real estate developments in several emerging districts. From now until 2020, there will be a total new office supply of 4.7 million sq. ft. in Kowloon East. The completion of the Express Rail Link Terminus and the West Kowloon Cultural District will contribute another 11 million sq. ft. of new office space to the market. These developments are estimated to attract an extra 93,000 workers to the respective districts, creating vast opportunities for F&B operators. In terms of future retail supply, 88% of the shopping malls scheduled to be completed before 2020 are in non-core areas. In the four core submarkets, over half of the new retail supply (1.6 million sq. ft.) will be from Ginza-type towers. A total of 23 industrial revitalization projects have been approved for conversion to retail facilities, providing 1.9 million sq. ft. GFA of space. Most of these properties are in emerging commercial districts such as Kwun Tong (33%), Cheung Sha Wan (23%), and Tsuen Wan (14%). New residential developments in emerging locations such as Shatin, Tseung Kwan O and Tuen Mun will also result in significant population growth in the next five years, driving strong demand for neighborhood dining options. 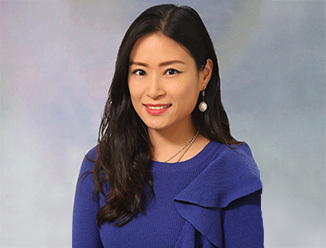 “The transformation of the Hong Kong retail market is structural and is likely to continue for the foreseeable future. The entire retail market is seeing a general down trend, evidenced by the total decline of 23% in average prime street shop rents from its peak in Q3 2014. Landlords are hence softening their stances in lease terms and tenant selection. This represents an ideal time for F&B operators to negotiate better lease terms with retail landlords to expand their footprint. 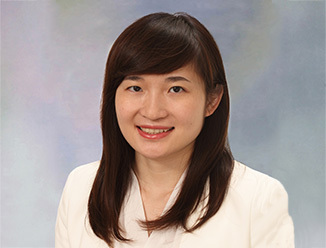 F&B owners may also consider taking up space in emerging districts to save operation costs and capture future opportunities,” Lin recommended.